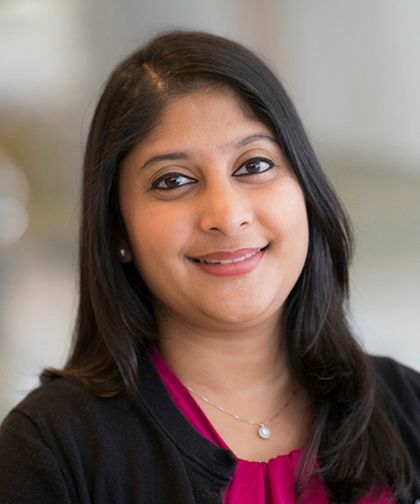 Neha Bansal, MD, is an Attending Physician in the Department of Pediatrics at Children’s Hospital at Montefiore and an Assistant Professor of Pediatrics at our Albert Einstein College of Medicine. Her clinical focus is pediatric patients who have heart failure due to cardiomyopathy or congenital heart disease, as well as pediatric transplant patients. She is also interested in echocardiography in the setting of heart failure, as well as cardiac care of survivors of childhood cancer. Dr. Bansal received her Bachelor of Medicine and Bachelor of Surgery in 2011 at Seth G.S Medical College and K.E.M Hospital in Mumbai, India. From 2012 to 2018, she completed a residency in pediatrics and a fellowship in pediatric cardiology at Children’s Hospital of Michigan. Dr. Bansal’s research focuses are pediatric cardiomyopathy, pediatric cardiac transplants and pediatric cardio-oncology. Her work has been published in numerous peer-reviewed journals, books, manuscripts, and articles. It has also been presented nationally. In 2017, Dr. Bansal received the Children’s Cardiomyopathy Foundation and Kyle John Rymiszewski Foundation Research Scholar Award. She is board certified by the American Board of Pediatrics and a member of numerous professional societies, including the American Society of Echocardiography, the International Society of Heart and Lung Transplantation, and the North American Society for Cardiovascular Imaging.